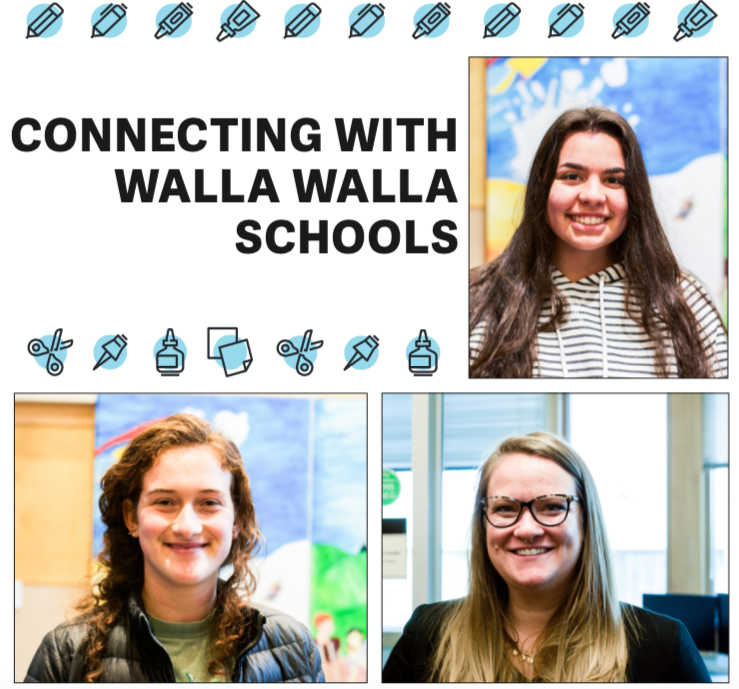 Alyssa Ortiz (top), Leah Samuels (left) and Lauren Schaefer (right) all work to connect Whitman with local schools in Walla Walla. Lauran Schaefer, the head of the debate program at Whitman, doesn’t see it as just an ordinary extracurricular activity. It is also an activity that builds skills, confidence and community. This community is now being extended to Walla Walla High School as Schaefer is working to help with their debate program, too. 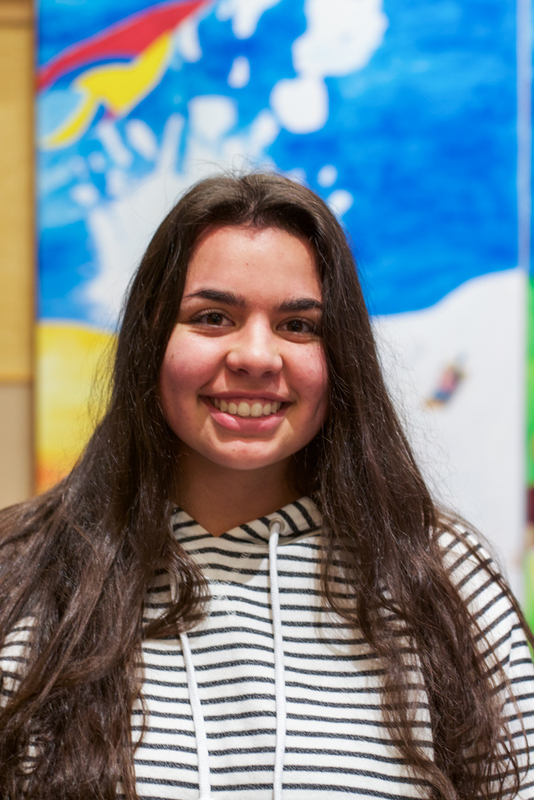 And she is not alone in this community building: Numerous Whitman students work in local schools through programs such as America Reads, America Counts, Bilingual United, Classroom Connections and more. Schaefer is spearheading an outreach program to the local junior high and high school debate programs. Schaefer said she has been volunteering to help at Walla Walla High School alongside Grace Fashanu, who is on the Whitman debate team. “I’ve been helping them with their Lincoln Douglas debaters and Grace has been helping them with the congress debate,” said Schaefer. Right now, their primary purpose is to help the high schoolers learn about debate and give them ideas on how to structure arguments. 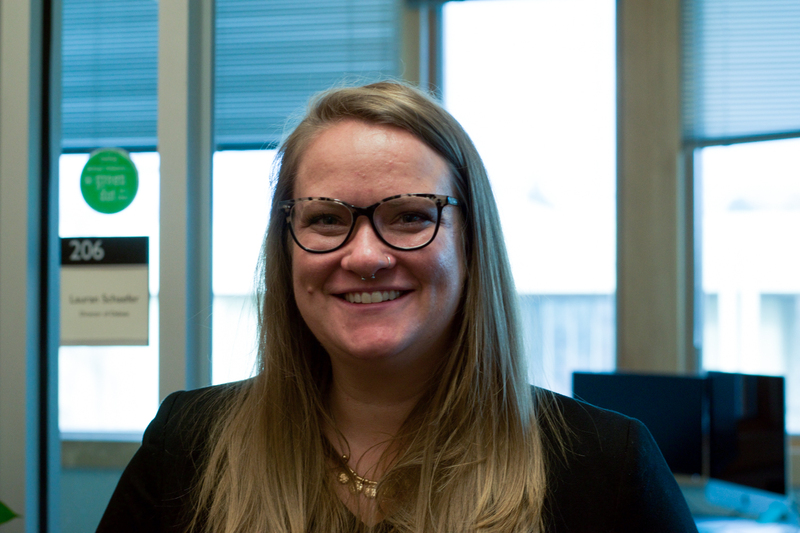 “We are really just there to help them, and give them the expertise that we have, given that we do it at a collegiate level which necessitates some form of expertise that otherwise wouldn’t exist,” said Schaefer. However, Schaefer doesn’t plan to stop here. “In the future we plan to have a more formalized system where we help them out with judging commitments at tournaments and doing that sort of work,” said Schaefer. Schaefer said that she plans on extending workshops and giving lectures for the high schoolers. Schaefer plans to make Whitman a debate hub for the local programs, potentially hosting a debate tournament for local high school students as well as programs from the Tri-Cities. Schaefer is creating this program in order to allow high school students to have a place to speech their mind in an organized and productive way. Schaefer hopes that this allows for students to practice being global citizens before there being major consequences for their actions. “Debate was really instrumental in not only helping me learn who I was as a person perhaps faster than my peers, but it also became a space where I learned to advocate for myself and for others,” said Schaefer. Schaefer is putting these philosophies into action as she moves into her new position as debate director. She hopes that her influence is able to start to shift this system from exclusive into a more nuanced and socially acceptable environment. Debate can be seen in the way of a varsity sport, allowing for strategic insight and growth in building relationships with people. It also allows people to see things from a perspective that they haven’t been in before by making people advocate for positions they personally disagree with. “It can be helpful in, for example, bridging the gap between the left and the right in the United States. As we’ve seen, folks who debate are much more likely to have productive conversations with people who disagree with them because we have strategies for having those conversations, ones that are much less enmeshed in the emotional context that those conversations often take,” said Schaefer. Debate has also been proven to increase rates of graduation in high school and provides a lot of scholarship opportunities for college. 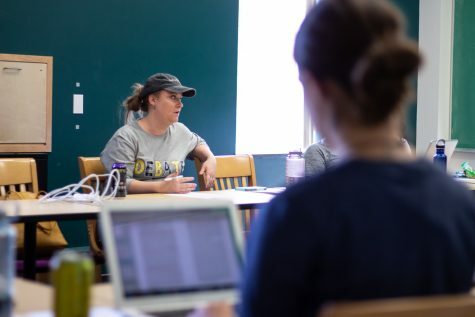 “Debaters often have significantly more academic success because debate is academic but it also has some sort of direction that it takes people,” said Schaefer. Once in the workforce, it can be extremely helpful in getting and keeping employment. Alyssa Ortiz is a freshman who works for the organization America Reads America Counts, better known around campus as ARAC. Ortiz volunteers at Green Park Elementary School three days a week. This semester, Ortiz works with first graders (6-7 year olds) and third graders (8-9 year olds). “It’s basically just tutoring and helping with reading and math skills,” said Ortiz. When working with first graders during the first hour of her time there, her primary tutoring is on math ability. “They do math workshop, and I just help them play math games that help them with addition and subtraction,” said Ortiz. In the second hour, she works with the third graders on reading, both in English and in Spanish. Ortiz was placed at Green Park Elementary, which allows her to walk to work. While Ortiz got lucky with her assignment, others have a longer commute. She originally found out about this job opportunity through Handshake, searching through her suggested job possibilities. “I was signing up at the beginning of the school year, and it was showing me things that would match well with my profile,” said Ortiz. Currently, Ortiz is works six hours a week, allowing for a good balance between her tutoring position and being a student at Whitman. Ortiz said that she appreciates the flexibility that ARAC allows for her in scheduling. “They understand that we are students, and that should be our priority,” said Ortiz. Even though this is a plus for the student, it can be somewhat of a disadvantage for the kids they teach. “I think that the kids make a bond with their mentor, and so at the end of the semester when the college students are switched to different classrooms, the kids have to re-bond with a different student,” said Ortiz. This is not Ortiz’s first time working with or being around children. Ortiz said she enjoys the opportunity to study the psychology behind the interactions with the kids. Ortiz talked about the merits of the program as it increases enthusiasm about subjects that are often dreaded by the children. “It just gives them the extra boost to want to think that learning can be fun, and it’s not just a bunch of memorization,” said Ortiz. She has observed many students bonding and being motivated by their mentees. “I can walk down Green Park hallways and see kids reading with their mentors,” said Ortiz. Even though there are many upsides to this job, Ortiz said her favorite is the children themselves. Leah Samuels is a first year volunteer at Edison Elementary School. She works with the Bilingual United program, which works to promote bilingual education at schools around Whitman. Samuels works in a kindergarten classroom with 16 kids. While Samuels teaches in both Spanish and English, her native language is English, so from time to time it can be difficult for her to explain an idea completely in Spanish. Samuels herself is still in the process of learning Spanish. The students themselves differ as to which language they prefer. 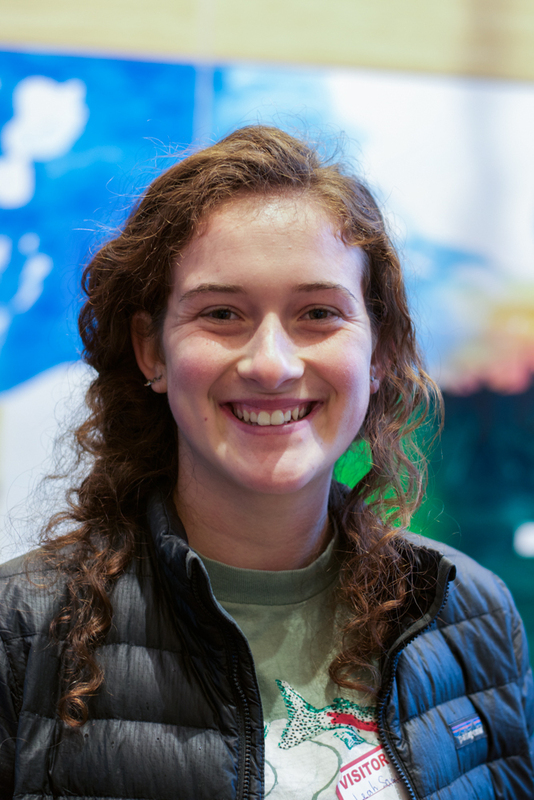 Samuels has known about this opportunity since high school, when she was looking at colleges. “I was talking to my tour guide, and I said I was really into Spanish, and they said I should check out Bilingual United, and here I am,” said Samuels. This job has a fairly flexible time commitment, as Samuels said she is allowed to work as much or as little time as she wants. When asked about the most rewarding part of the job, Samuels talks about the evolution of the kids’ self-esteem. While Samuels herself is not interested in pursuing a teaching career, many of the other volunteers have been influenced to do so. “One of the people I work with designed their own major going into bilingual education because of Bilingual United,” said Samuels. Samuels said that she believes having a bilingual education allows for exposure to perspectives other than one’s own personal experiences. “I think kids who grow up with a bilingual education tend to have less prejudice towards other cultures and other races than their own,” said Samuels. Knowing two languages can also double the opportunities accessible to you. “If you know two languages, there are so many more jobs, colleges, places you can visit, just so much more available,” said Samuels. Samuels advocates for more outreach to the general Walla Walla community. 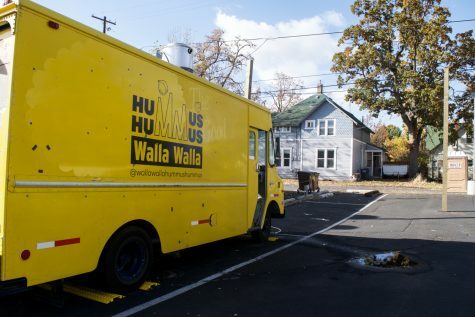 “As college students we spend most of our time on campus, and if we are not on campus we are interacting with adults of Walla Walla, and I think that kids are an entire other population, an entire other demographic that we are just not connecting to,” said Samuels. Samuels also mentioned the importance of volunteering, and how it is valuable for everyone, not only the kids themselves. An eventual goal of Bilingual United is to expand to high schools and reach a larger population of students. “I think it’ll just keep steadily growing as people realize the importance of a bilingual education,” said Samuels.